Gracie Temple has high hopes for finding contentment in the small town of Harmony. That is, until her protégé, the pastor's daughter, goes missing and her plans for a peaceful wedding are threatened. Will Gracie find a way to overcome discord in Harmony or hightail it back to the city? About "Simple Choices (#03 in Harmony Series)"
This three-story saga takes readers on a delightful journey through Mennonite and outsider relationships. Acclaimed author Nancy Mehl uses her trademark touch of light mystery combined with sweet romance to create the lives of characters in a homey Kansas setting that readers will not soon forget. With her trademark touch of light mystery combined with sweet romance, acclaimed author Nancy Mehl takes readers on a delightful journey through Harmony, Kansas. After Gracie Temple’s uncle leaves her a house in a rural Mennonite community, she soon learns he secluded himself for years to protect a secret about her own father. Can Gracie maintain the secret, or will this small town give her the friendship, clues—and love—she needs to expose it? Gracie had hoped to make Harmony her home and explore romance with farmer Sam Goodrich, but when a developer moves in and hires her as graphic designer, the town’s outrage may send her packing. Should she leave or stay and fight for what she has come to love? Gracie again has high hopes for finding contentment in the small town of Harmony. That is, until her protégé, the pastor’s daughter, goes missing and her plans for a peaceful wedding are threatened. Will Gracie find a way to overcome discord in Harmony or hightail it back to the city? 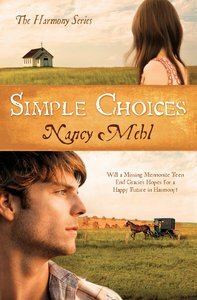 Treasure this compilation of three romances set in a fictional Kansas Mennonite community and written with author Nancy Mehl’s trademark touch of mystery. In this sequel to Simple Secrets, there is nothing simple about deceit and how it threatens to tear apart the Mennonite community Gracie has come to love. Gracie Temple has grown to love the Mennonite town of Harmony, Kansas, and the house bequeathed to her by her late uncle. New friendships among the residents, including the handsome farmer Sam Goodrich, seal her decision to leave Wichita and do freelance graphic design work from her new home. But when Gracie is assigned a new client who is a developer intent on building an upscale retirement community in Harmony, the town is split. Some welcome the business opportunities while others fear the exploitation of the Mennonite lifestyle and the loss of their simple ways. As the citizens of Harmony begin to turn on each other, an anonymous note accusing Gracie of being the mother of an abandoned baby causes Sam to seemingly turn his back on her. Soon Gracie is reconsidering her choice to stay in town. But before she can make a final decision, a major winter storm moves in that will put a friend in danger and take the life of another Harmony resident. The blizzard also forces Gracie to make a choice that just might lead to the final straw between her and Sam. Gracie had hoped to make Harmony her home and explore romance with Sam, but when a developer moves in and hires her as graphic designer, the town’s outrage may send her back to the city. Can she help the town fight the development of tourism while avoiding being framed for arson? In the sequel to Simple Secrets, watch how a raging current of deceit runs through the once peaceful Mennonite community of Harmony, Kansas. As soon as Gracie decides to stay in town and take freelance work involving a local land developer, the townspeople blame her for bringing on this change that could ruin life as they know it. Gracie’s motives in romance with Sam, in helping an oppressed teenager, and in trying to make a living are all suddenly drawing suspicion. Should she leave or stay and fight for what she has come to love? A lot goes on in this book and it's an enjoyable, well paced novel. I've read a lot of Christian fiction through the years and this is certainly one of the better ones. I enjoy the way it shows the love of God, less preachy, more simply being revealed throughout the book. Pleasant, joyful read. This is a fast paced story of faith,deceit,secrets,love and a communtiy.While this is a Christian it is not preachy but allow each to grasp their own faith.A wonderful sequel to "Simple Secrets". While this is the second book in a series I feel like it could easily be read as a stand alone work, the author provides enough background that you feel perfectly at ease in the tiny town of Harmony...Anyone who enjoys a nice mystery woven together with a bit of romance set in a nice little town full of interesting characters really should check this series out. This book has everything readers of Christian mysteries could want, and more. You'll find generous doses of drama, danger, humor, faith and love, plus fictional characters who seem like familiar friends. The blizzards that plague Harmony provide an ideal ambience for the writer's cozy, pleasing story-telling style. Each book I read in every series becomes my favorite.